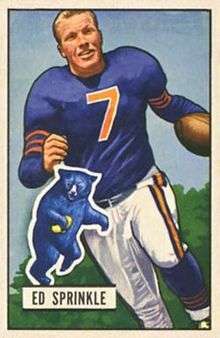 Prior to his NFL career, Sprinkle won three letters in football and two in basketball and earned All-Border Conference while at Hardin-Simmons University in the early 1940s. He earned all-Eastern honors in 1943 while attending the United States Naval Academy. Following his pro career, Sprinkle entered business in the Chicago area. He died on July 28, 2014. ↑ Goldstein, Richard (August 1, 2014). "Ed Sprinkle, Defensive End Known for Violent Play, Dies at 90". nytimes.com. New York Times. Retrieved August 1, 2014. "Ed Sprinkle" (PDF). Coffin Corner. Professional Football Researchers Association. 12 (1): 1–3. 1990.